At the time of the eye examination your optometrist & dispensing optician will advise you on the choice of suitable lenses, taking account of your occupational or recreational needs, and your prescription. 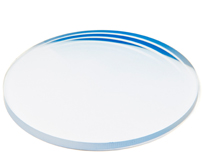 Lenses can also be supplied in a wide range of tints, including transitions which darken automatically in sunshine outdoors, and fade indoors. If you feel the time has come for varifocals or bifocals, we have a demonstrator in the practice which gives you some idea of the vision obtained through both types of lens. This helps you to make your decision before purchasing your new spectacles. We supply a wide range of frames to suit all budgets and tastes. Chosen with quality and durability in mind. All frames guaranteed for 1 year. Single vision lenses correct for only one distance. If they correct for far distance, the person must accommodate to see clearly up close. 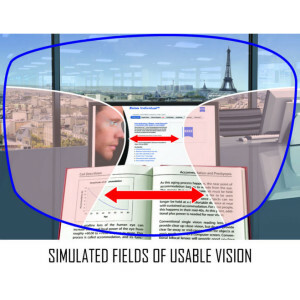 If the person cannot accommodate, they may need a separate pair of single vision glasses for near distances, or else use a multifocal lens (see below). With a bifocal, the upper part of the lens is generally used for distance vision, while the lower part is used for near vision. Usually, a segment line separates the two. Typically a person with myopia would have one section of a prescription lens that has a certain diverging power while another section of the lens would have a lower diverging power for close-up work. Similarly a person with hyperopia would have one section of the lens with a certain converging power and another section with a greater power for close-up work. Trifocal lenses are similar to bifocals, except that the two focal areas are separated by a third middle area with intermediate focus correction, used for intermediate vision, roughly at arms’ length, e.g. computer distance. This lens type has two segment lines, dividing the three different correcting segments. Progressive or varifocal lenses provide a smooth transition from distance correction to near correction, eliminating segment lines and allowing clear vision at all distances, including intermediate (roughly arms’ length).